Stealing the Light, directed by Aimie Burns, is an independently-produced documentary about the critical importance education plays in conflict-affected areas. This film focuses on the story of Dr. Mohammad Khan Kharoti and his personal journey to build a school in his home village of Shin Kalay in Helmand Province of Afghanistan. Green Village Schools was founded in March 2001 with only 16 students. It grew to over 1,200 boys and girls by 2008. Sadly, tragedy struck in October 2008 when an unidentified group of men looted the institution, bulldozed it, and destroyed everything, leaving it in a heap of rubble. Through the words of former students and Mohammad himself, we see the impact that Green Village Schools had on the students and the village of Shin Kalay as well as the devastating aftermath of its loss. We follow Mohammad on his emotional journey to rebuild his school, from the fundraising efforts in the US to the brick-by-brick reconstruction in his home village. 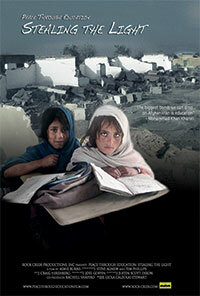 Stealing the Light examines the role of education in minimizing conflict and creating critical opportunities for children in Afghanistan.